The United States Congress designated the Black Rock Desert Wilderness (map) in 2000 and it now has a total of 314,835 acres. All of this wilderness is located in Nevada and is managed by the Bureau of Land Management. 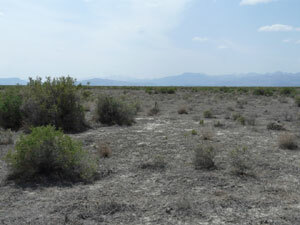 The Black Rock Desert Wilderness is bordered by the Pahute Peak Wilderness to the west and the South Jackson Mountains Wilderness to the east. The Black Rock Desert Wilderness, which contains the eastern arm of the Black Rock Desert, is the largest Wilderness managed by the Bureau of Land Management. The Black Rock Desert is the dry lakebed of ancient Lake Lahonton and vegetation in the area consists mainly of saltbush and greasewood. Large portions of the area are unvegetated. Elevations range from 3,900 to 5,931 feet on top of Elephant Mountain. The Wilderness is essentially flat with the only topography occurring at Elephant and Pinto Mountains on the western edge of the area. During years of heavy snowpack the Quinn river flows through the area. The Wilderness also contains important paleological resources along the old lakeshore. Several mammoths and a saber tooth tiger have been excavated from the area. Wildlife in the area include; mule deer, pronghorn antelope, mountain lions, coyotes, and sagegrouse. Planning to Visit the Black Rock Desert Wilderness? How to follow the seven standard Leave No Trace principles differs in different parts of the country (desert vs. Rocky Mountains). Click on any of the principles listed below to learn more about how they apply in the Black Rock Desert Wilderness.